The transfers come powdered and have to be cleaned with water and/ or a little alcohol and a piece of sponge before use. After cleaning and drying, take a piece of sponge and stipple a light coat of Pros-Aide adhesive (can also be thinned with a little water) over the appliance and all the way over the edges of the piece until the Pros-Aide stops beading up. For even thinner edges take another clean piece of sponge and take off any excess and let dry until clear. Put the transfer face down onto the shiny side of the transfer paper and press lightly in the middle, firmly all around the edges. Now the transfer is sandwiched between the acetate and the paper. Cut the paper close to the edge all around the piece avoiding to cut into the piece itself. Remove the acetate carefully, press the transfer onto the clean skin and again press firmly especially around the edges. Wet the paper with water until it starts to slide off the transfer. Let dry and in case anything should show around the edges, work them further into the skin using a Q-tip and a little alcohol. Seal with a make-up sealer and take away shine with powder or an antishine creme. It is important to let the Pros-Aide dry completely clear before applying the transfer to the paper. 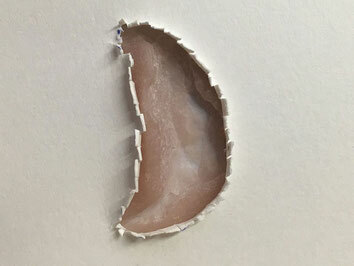 With transfers with high detail, the paper should be precut in the shape of the actual wound area of the transfer before it is put onto it, so detail and edges don´t get squashed.